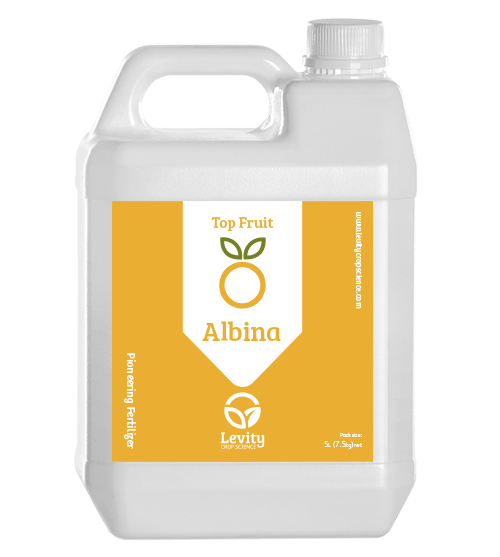 Albina for Top Fruit is a pioneering new product that reduces physiological disorders, and improves fruit firmness and shelf-life. Albina works by helping fruit absorb calcium, a nutrient that can improve quality but is poorly absorbed by fruit. Albina uses Levity’s pioneering chemistry, to stimulate calcium absorption into fruit, where conventional products cannot. it will help reduce bitter pit and russeting (apples), cracking (cherries), core breakdown (pears), pitting and bruising (stone fruit) and chilling injury (pomegranate) as well as improving post harvest shelf life and firmness to higher standards using very low inputs. Key Benefits: Firmness, shelf-life, and reduced physiological disorders. Application rate: 1 l/ha foliar spray at flowering followed by 3 additional applications during the season. Sulis for Top Fruit builds maturity (colour and brix) in Top fruit crops including apples, pears and peaches, it works by supplying molybdenum and boron in a special formulation that helps the fruit maximize the function of the processes responsible for the maturation process in fruit crops, building better levels of colour and brix to allow earlier picking. The chemistry in Sulis uses these nutrients alongside natural chemistry developed by Levity’s team of crop scientists, that actively encourage the functioning of the plants natural process of maturity, whilst ensuring these key nutrients in the process are available. Sulis also contains cell wall stabilisers, so that whilst colour and sugars build the developing fruit can also maintain firmness. Normally there is a trade off between colour and sugar formation and softening, Sulis is designed to manage this process so that farmers can get the quality they need whilst still picking fruit that’s firm. Key Benefits: Improved colour formation, improved brix levels, better fruit firmness.